Frosé might have been drink of the summer, but as the nights draw in, and you’ve had your first seasonal argument about whether or not to put the heating on, well now's the time for something altogether more warming. We like chocolate, and we love wine, so when we came across Houston-based blogger immaEATthat's brilliantly simple recipe, we knew we'd found our new drink for winter. And the best news about this ultimate ‘why didn’t I think of that?’ drink? It's so easy to make. We're thinking: pre-Fireworks display tipple, Christmas eve round the fire, or curled up watching the new releases on Netflix. Winter bliss. To make the drink at home, immaEATthat (real name Kylie Mitchell) suggests combining a third of a cup of dark chocolate chips and one and a half cups of milk over heat in a pan to produce a basic hot chocolate. 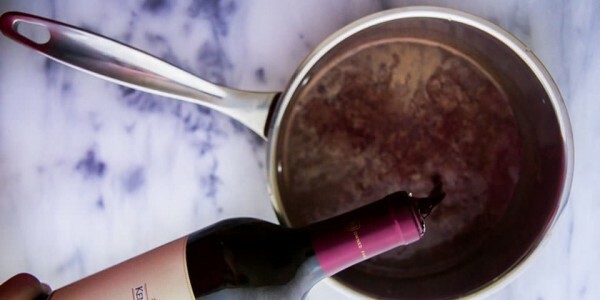 Give this a good stir, then pour in a cup of red wine, and keep stirring until fully absorbed. Pour into a mug and serve with some whipped cream (if you like). Ridiculously easy. Ridiculously tasty. Kylie warns that the drink is RICH. You're not going to want to guzzle this one by the glass; it's more of an easy sipper. But that's the beauty of winter tipples. This most marvellous of marriages brings the warming aspects of mulled wine or a hot toddy together with the sweet, sweet soul of chocolate.